While people do occasionally cross oceans in dinghies, race around the buoys aboard schooners and entertain their friends on racing catamarans, most of us try to match our boats more closely to our needs. While people do occasionally cross oceans in dinghies, race around the buoys aboard schooners and entertain their friends on racing catamarans, most of us try to match our boats more closely to our needs. 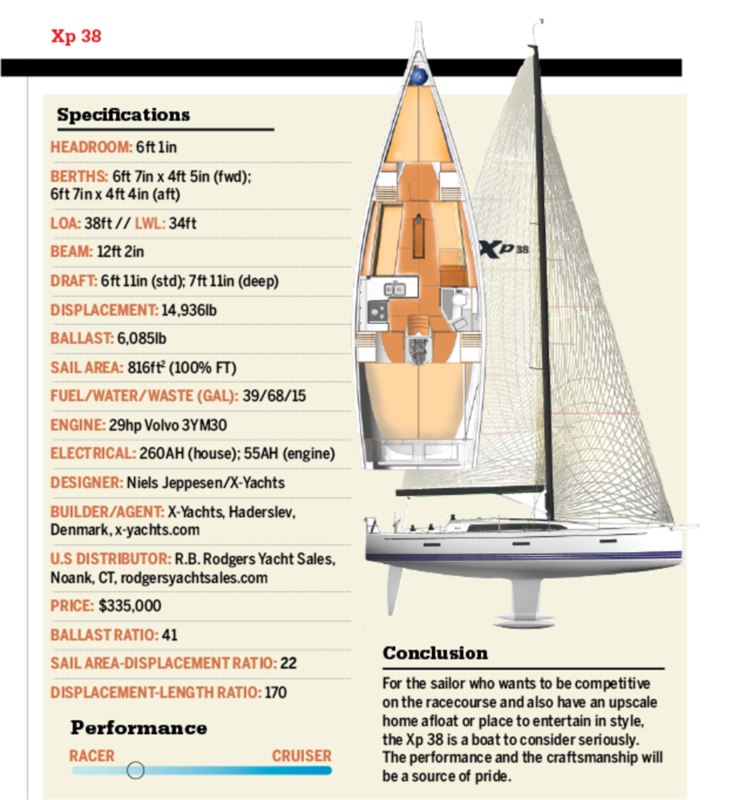 With this in mind, the Xp 38 is a true dual-purpose boat, a racer/cruiser that excels in a variety of roles. The hull itself is E-glass set in epoxy, vacuum-infused and cured under high temperature. Both the hull and deck are cored with Divinycell foam, except around high-load areas, like the interior frame. The electrical and plumbing installations are neatly done and employ high-quality components. The wiring is tinned, which is unusual in a European boat. Our test boat had the standard fin keel, which draws almost 7ft, but serious racers may prefer the deep keel, which draws nearly 8ft. The Xp 38 has a lead/antimony bulb instead of the more common iron ballast found in less expensive European craft. The finish work is elegant. Cabinets fit perfectly and the glass work on visible surfaces and in out-of-the-way corners, is neat and well made. The deck is clean, open and optimized for racing. It’s also downright pretty, with sculptured leads to take the lines under cover, nicely rounded rails to keep the “rail meat” comfortable, and beautiful hardware throughout. The teak decks on our test boat were also lovely and functional. Overall execution straddles the line between art and engineering. The helmsman has an easy life aboard the Xp 38. The helm seats are actually the side decks, because the cockpit seats end ahead of the wheels, and they are perfectly positioned for easy steering and excellent visibility both to windward and to leeward. The walk-through transom has a small ledge to keep the cockpit sole dry in following seas. The rest of the layout will work well for both small and large crews. A long traveller on the cockpit sole immediately forward of the twin helms puts the mainsheet within easy reach of either the skipper or a crewmember. There is also a set of jibsheet winches close at hand for whoever is driving. We sailed a boat with the standard alloy mast, but you can order a carbon rig, which is not only lighter, but taller, expanding the mainsail by another 70 square feet. That’s a lot of horsepower for a boat this size. Tick off a few other performance options on your order sheet, pile a skilled crew aboard, and the Xp 38 should make a world-class racer. 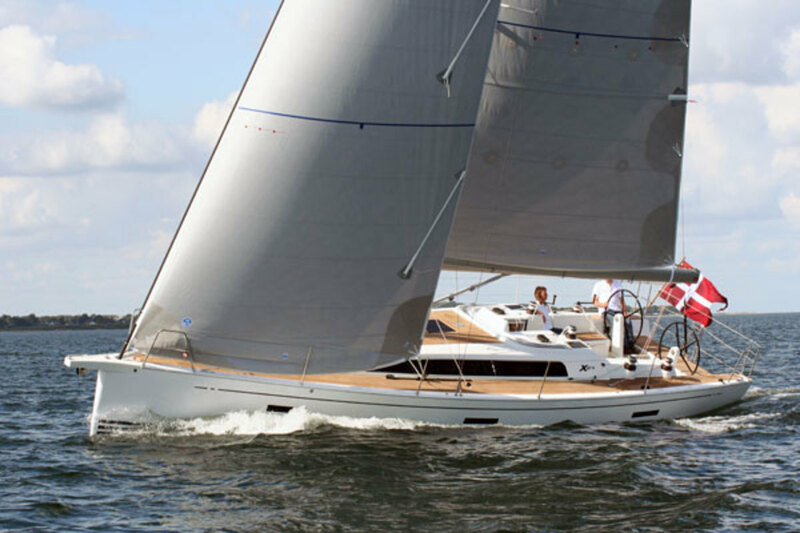 There are several bow configurations, depending on whether you want a small bowsprit with the anchor, an integrated anchor roller or no exposed anchor at all. 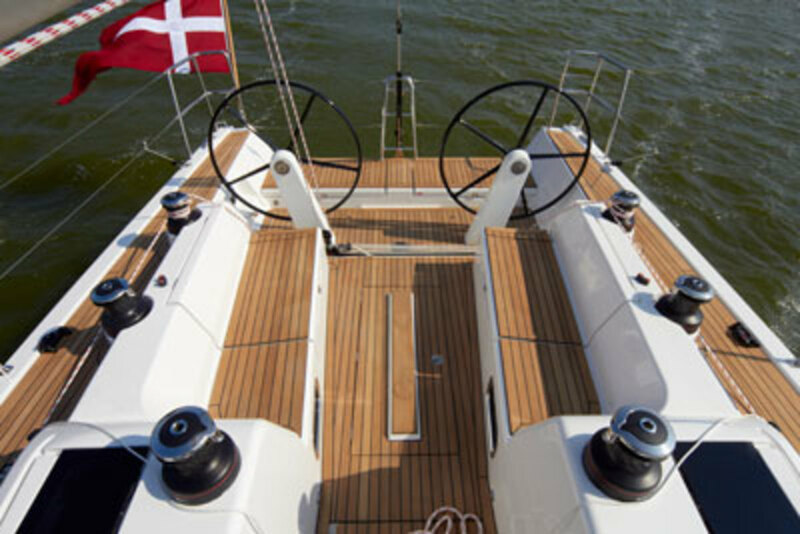 Step down a nicely designed companionway and your first impression is apt to be “Danish modern.” The interior is clean, functional and calm, with a nice balance of contours, wood, fabric and white that any Bauhaus designer would appreciate. The grab rails are blended into the overall design, the corners are rounded, and the fiddles are high enough to do some good. A compact chart table slides fore and aft to accommodate the navigator’s preference for facing either forward or aft. The layout is a practical one for a modern racer/cruiser. The two aft cabins on our test boat included pipe berths in addition to the regular mattresses, a perfect way to get secure sleeping for distance racing offshore. For daysailing or family coastal cruising, these same spaces will be great for stowing clothing and other soft gear. 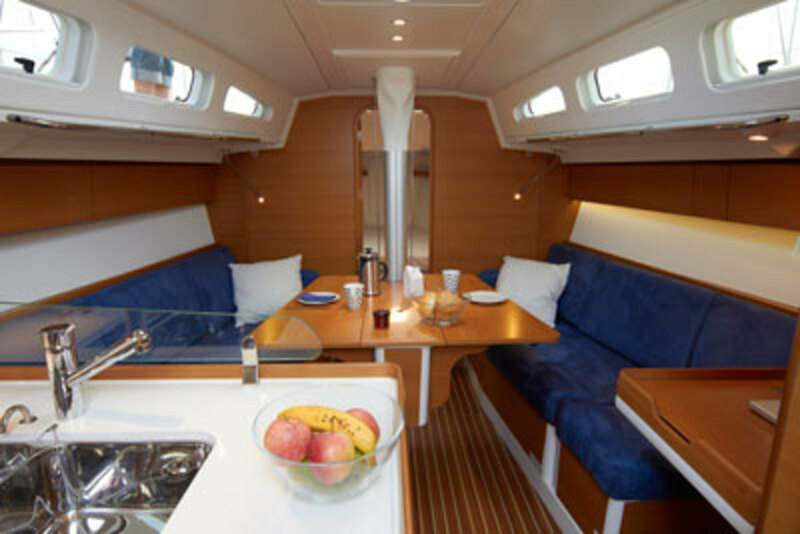 The forward cabin has a standard V-berth, which will be just right for quiet nights at anchor or in a marina. Lockers throughout the cabins provide good stowage space for a week or two with family or friends. This is a boat that will easily shift gears from a romantic weekend on Long Island Sound to racing with a half-dozen sweaty guys. We sailed out of Annapolis into the Severn River on an evening with winds fluctuating around 7 knots, gusting higher. While light rain and the 50F temperatures kept us in foulies, the performance of the Xp 38 was sparkling. The helm was light, and it was easy to respond immediately and accurately to the frequent wind shifts. If we had been racing, it would have been one of those windward legs that separates the skippers who concentrate from those who do not. It would also have been one in which a boat that responds like the Xp 38 has a clear advantage. I had a splendid time feathering into the puffs with the rail down and tacking consistently through about 80 degrees. On a starting line, the nimbleness would be mighty welcome. In 8 to 10 knots of wind the Xp 38 produced a reliable 6 knots of boat speed to windward and 7 to 8 on a close reach under the standard main and genoa. We set the asymmetric spinnaker in 10 knots of wind and held 8.5 knots of boat speed until a puff rounded the boat up as the rudder ventilated. There’s a lot of sail power up there, but the running rig setup handles it well. Contributing to the enjoyment was the ergonomic cockpit design. Convenient pop-up foot braces made sitting up to windward comfortable and the visibility in all directions, including to the jib telltales, was excellent. The Xp 38 is a pleasure boat, in the best sense of the term. The easy, precise handling continued under power. The Xp 38 spun on its fin keel in less than one boatlength, stopped straight and backed accurately, with no discernable kick either to port or starboard. With handling like this, the skipper will look as competent around the docks as at the starting line. A cruise setting of 2,800 rpm yielded 6.8 knots through the water and a modest sound level of 72 dBA. Full throttle on the diesel drove the boat up to its calculated hull speed of 7.8 knots.